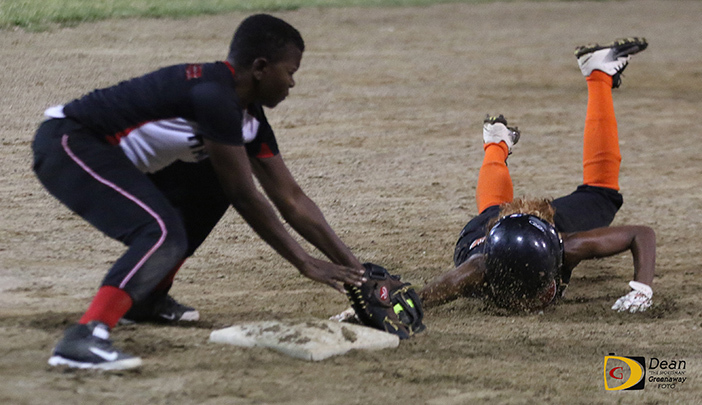 There were late inning explosions during Sunday night’s opener of the Virgin Islands Baseball Softball Association Harriette Skelton Softball League Championships Series at the E. Walwyn Brewley Softball Park in Road Town. That’s Ya Problem used Tylia Nibbs-Henley’s one out double over the centerfielder’s head in the bottom of the seventh inning, to complete a thrilling comeback from a 19-11 deficit, for a thrilling 20-19 victory over the Hawks to take a 1-0 lead in the best of five series. TYP sat on an 11-10 lead after five innings, before the drama began unfolding. The Hawks batted around in the top of the sixth, when they sent 12 batters to the plate. They capitalized on six TYP errors, scored nine runs on five hits to take a 19-11 lead, the last run coming off Celine Thomas’ 3-run homer. However, the Hawks then made three costly errors as TYP batted around, scored six runs on three hits in the bottom of the inning, to pull within 19-17, then held the Hawks scoreless in the top of the seventh, before scoring three to win. Smith said they had a very bad inning when the Hawks batted around and scored nine runs in the sixth, but said they told the girls to keep fighting and once they stay close, they could come back. Hawks manager Julian Adams declined to comment on the game. Play between the teams resumes on Friday.